This part of the site is dedicated to resources and utilities developed for computers using the RISC OS operating system. Using !Webserve as a webcache proxy. The Oregano web browsers, both 1 and 2, lack a web cache so fetch files from the web for every page, including pages just fetched, e.g when using the back arrow. By incorporating !Webserve as a proxy, previously fetched pages are not downloaded but taken from a cache on the hard disk. Click here for instructions on setting up !Webserve as a webproxy. This release of the duplex printer definition files combines and supersedes version 2.20 for Brother Printers and version 3.03 for Generic PostScript printers. This version aims to cover PostScript printers from 20 manufacturers. The method of installation is more straightforward than that used in the earlier versions but contains the same functionality as previously. This driver allows duplex (two sided) printing automatically from up to three paper trays and the Manual/Multi-Purpose Tray, flipping on either the long side or the short side. This duplex driver accommodates both the Acorn PostScript 2 and the new PostScript 3 printer driver available from Martin Würthner's website. Version 1.15 (or later) of the PostScript 3 printer driver (!PS3), now has the coding to operate the feeds in the same way as the PS2 driver. Earlier versions do not have this code so you must upgrade to the latest version to take advantage of this feature. Click to download PDFs for PostScript duplex printers. Release 4.00 8 June 2018. This Printer Definition File enables duplex printers which don't have PostScript capability to print on one or both sides of the paper from RISC OS, flipped on either the long or the short side. The printer must be able to respond to Printer Command Language (PCL). Until now PCL printers have only been able to print on one side of the paper using the HP Laserjet Printer Definition File. This PDF provides that missing capability.. I have successfully printed in duplex using this PDF with my Brother printers which have PCL emulation in addition to PostScript. The key to this capability is a new PDumper which is the work of Herbert zur Nedden, developed from PDumperLJ. This was submitted to RISC OS Open Ltd. and accepted into the CVS and has now been incorporated into the nightly builds. Click to download PDF for PCL duplex printers. Release 1.00 17 June 2018. 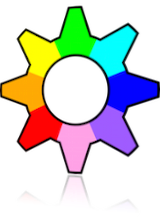 This pdf file will print a whole page of blocks of the Key and three primary colours found in most laser and inkjet printers. 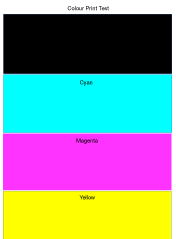 This can be useful in identifying printing problems particularly when using compatible toner cartridges. Click to download Colour Print Test. Version 2 Released 4 April 2019. Relocating !Pluto Articles Files for easier backup and networking Pluto on different computers. The default setup for the mail and news reader !Pluto, is for the data (the Articles Files) to be contained within the application. Jonathan Duddington did make provision for the Articles files to be located elsewhere which makes routine backup of these files easier to organise if they are located in the same directory as your other data. I have devised a straightforward way of providing an alternative place (a pseudo application) to put the Articles files (and Choices) which once set up, allows the Articles Directory to be moved between the Pluto application and the new location with a simple shift drag and returned again if necessary. Full instructions on how !PlutoDat works and is set up, can be found in the Help file to be found inside the pseudo application. PlutoDat is also a useful way of providing a single location for access of files over the network. This version now implements full parallel alignment between the Master !Pluto and the Slave !Pluto running on the remote computer and is a major update over previous versions 0.5x or 0.60. A solution has been found to the problem of Pluto storing the hardcoded paths to transport applications in Choices, the solution allows the same Choices to be used in the slave installations as used in the Master installation. When the Slave Pluto quits, any Backups of downloaded Mail and News (and NewsHound dunGroup file) are transferred back to !PlutoDat where they are retrieved by the Master !Pluto the next time it is run. All that is required are the addition of some obey files to !Pluto and the replacement of the !Run files of the Master and Slave copies of !Pluto by supplied substitute !Run files. Instructions and examples are provided of two obey files which need to be tailored to the machines on which they run, this will enable the transport programs to be found on different systems and allow the Slave !Pluto to find !PlutoDat. This update (v1.00) has made major changes to the way the networking is set up, which has corrected some serious shortcomings in the previous versions (v0.5x and earlier) so is a Recommended Update. Click here to download !PlutoDat. Release 1.01 03 February 2019. Instructions from the RISC OS 4 upgrade Manual.